If Lowndes County owed $0 (zero dollars) on the county palace in November 2010, why are we paying on $8,965,000 in bonds for it in December 2012? If that palace was "100% Paid by SPLOST" in 2010, why in 2012 is the county pledging our property tax dollars to pay those bonds? 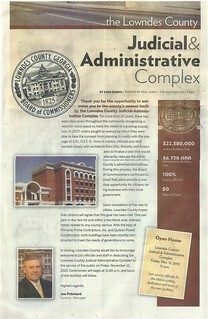 So says a double-page flyer about "the Lowndes County Judicial & Administrative Complex" produced by the Valdosta Daily Times for Lowndes County in 2010 and signed "Highest regards, Joe Pritchard, County Manager". There's no dateline, but it invites the public to a dedication of the Complex "on Friday, November 12, 2010."